This post was sponsored by wet n wild as part of an Influencer Activation for Influence Central and all opinions expressed in my post are my own. Is it me, or is the holiday season also the perfect time to rock some glitter all over? Now ya’ll know me— usually I’m not a huge glitter person when it comes to my makeup. 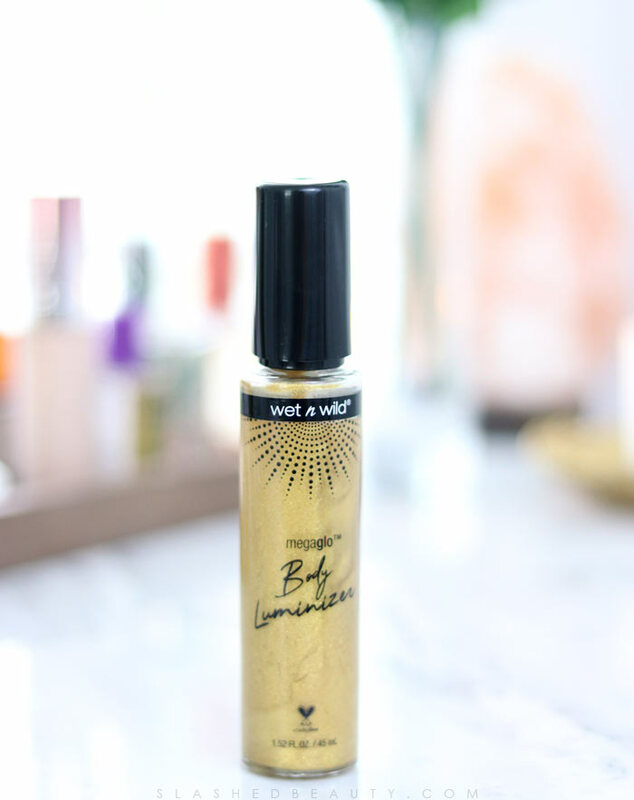 But I do like to get my shimmer on every once in a while for special occasions and photo ops, and the new wet n wild MegaGlo Body Luminizer was going to be the perfect go-to for making a statement as soon as I saw it on the shelf. 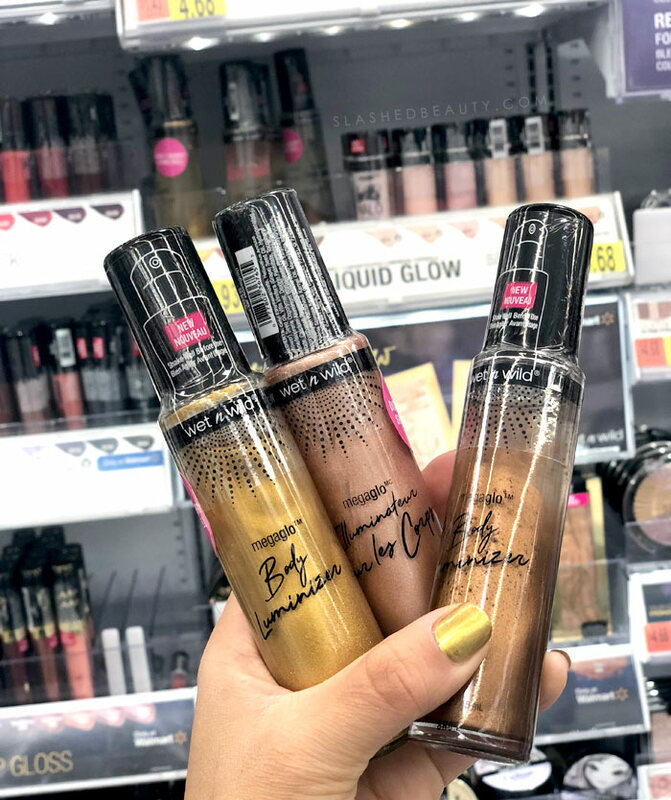 wet n wild just released the MegaGlo Body Luminizer exclusively at Walmart in three shades: Gold Rush, Heart of Rosegold, and Invested in Bronze. 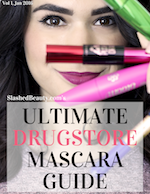 They’re all cruelty-free, gluten-free, and paraben free. The Gold and Bronze shades are vegan, too! The MegaGlo Body Luminizer can be used all over, both on the face and body. It’s a buildable formula that starts out luminous but can be layered for an all-out sparkle. The formula has micro-fine pearl pigments and moisturizing ingredients like argan, macadamia, passionfruit seed, grapefruit seed and sunflower seed oils! I was personally drawn to Gold Rush the most. 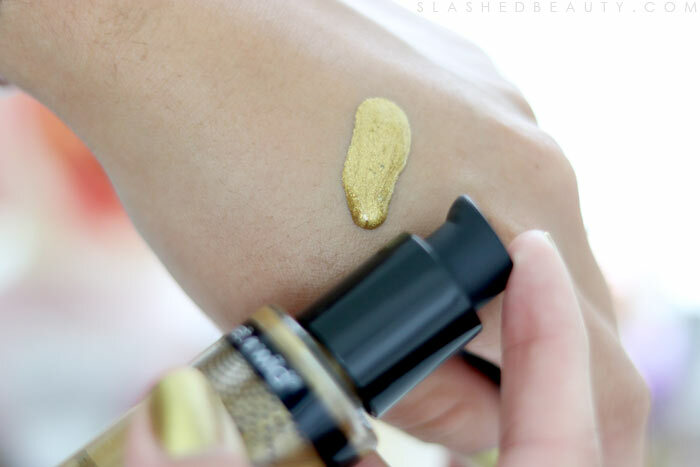 It really looks like melted gold in a bottle! I’m also all about gold tones for the holidays. I also think that Gold Rush is the most universal in terms of flattering a broad range of skin tones. One pump is all it took for me to fall in love. In fact, one pump is actually a lot of product when it comes to this luminizer, because it’s practically an opaque streak of gold. Less is definitely more depending on the effect you want. I suggest starting out with a half pump and build up the intensity. My favorite places to apply the MegaGlo Body Luminizer are the tops of my cheekbones and my collarbone. (I’ve been highlighting my collarbone more in low-cut and cold shoulder tops and LOVE the effect!) I find it easiest to apply with a damp blending sponge— this helps soften and diffuse the effect and help build up the product slowly. I pump a little product directly onto the sponge and start dabbing it onto the skin. I personally like to go all out when using a product like this, applying with a heavier hand for a dramatic effect. If you want it to be more subtle, apply slowly and start out with small dots of product on the sponge. This is the finished effect when I use the wet n wild MegaGlo Body Luminizer in Gold Rush. Talk about a statement, am I right? I absolutely love the way the shimmer catches the light. My preference is to pair the shimmer with very fresh-faced makeup so that it does all the talking, really amping up a clean look. On the collarbone, it just makes my skin pop and also adds a nice finishing touch to any outfit that shows a little skin. Just because it’s winter doesn’t mean you can’t show off a glowy complexion. I will say: because this highly concentrated formula is packed with glitter, it can be a bit of a process to remove. I’ve found the easiest way is to start out with a makeup wipe, then use an exfoliating cloth to grab any remaining glitter particles. I will say that for a glitter, it’s on the easier side to take off. 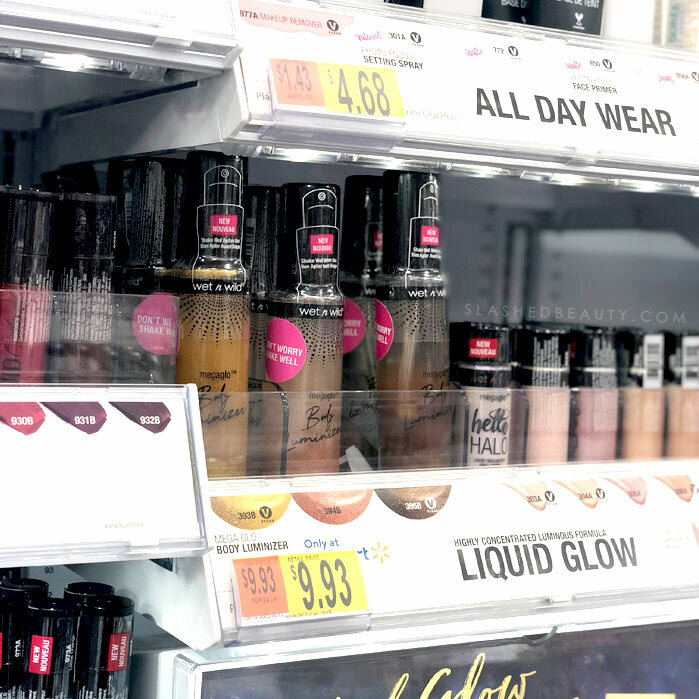 As I mentioned, the wet n wild MegaGlo Body Luminizer is a Walmart exclusive and is available for $9.93. 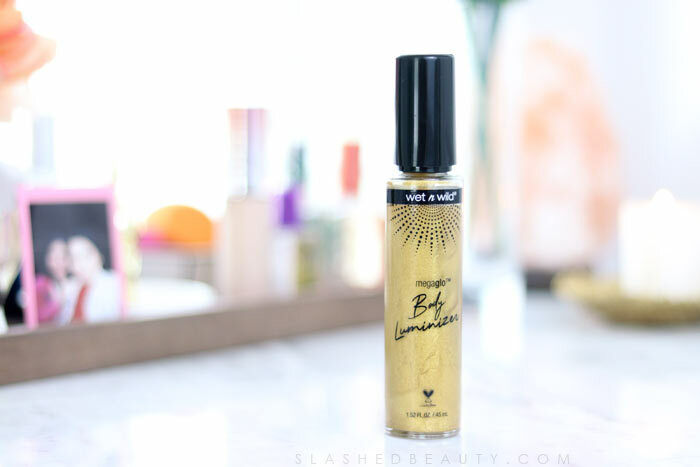 This is already super affordable but considering how little you need to make an impact on your look, this huge bottle will last you a long time. How do you like to add shimmer to your holiday looks? Wow!!! That is a really pretty warm glow! I may have to give a try too! The gold is the perfect pop of color against your skin tone! 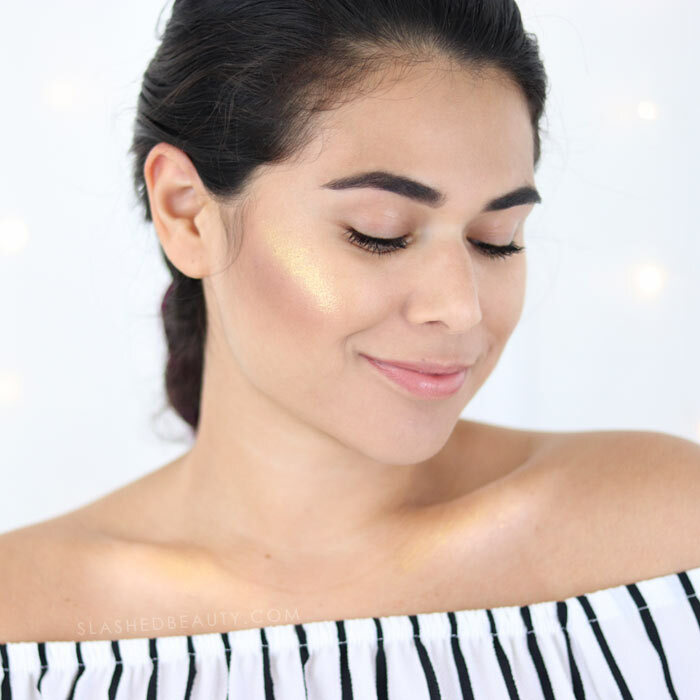 The gold highlight looks gorgeous on you! 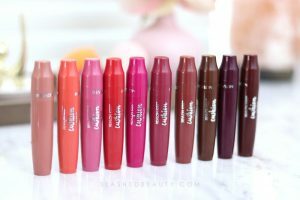 I didn’t know that wet n wild dropped a body MegaGlo product, that’s exciting! I love the gold highlight on you. The rose gold one works best for me! I saw your picture on IG and I did a triple take to see what the glow was. I’ve got to pick up one of these. That sure is a fabulous pop of glow! How pretty for holiday fun. It’s great to not have to spend a lot on something that isn’t used constantly. Wow, what a pretty glow! Great holiday accessory or stocking stuffer!